In this project, we were asked to conceptualize, plan and execute a distinct and innovative new media product for a local business, the Terrapin Beer Company. We decided to focus on the sense of community and friendship that exists within the craft beer community. We learned that this community was very strong and tightly knit, and that the beer enthusiasts would appreciate information on individual craft beers. These beer enthusiasts enjoy boasting to their friends that they have enjoyed a greater variety of beers than anyone else, along with enjoying the ability to have a great breadth of knowledge of what they have imbibed. We named our app TerrAppin, to emphasize its mobile nature. The way to distribute information on Terrapin’s beverages was through the use of QR codes. Each beer would be given its own individual mobile web page, each optimized to display a uniquely sized appearance for smart phones, tablets, and desktop computers. These web pages provide information about the alcohol content and ingredients involved in their brewing in a quick format for the user. There is also more detailed information for users who wish to investigate their beverages further. Each beer would also receive its own QR code to be displayed on retail bottles and packaging, in addition to being displayed at the brewery when it is available on tap. Each page contains a Facebook “like” or “recommend” button. These buttons allow the user to inform their Facebook friends that they drank or enjoyed one of Terrapin’s products by posting to their newsfeeds and walls. Users are also awarded with a button for each type of beer they are logged as having liked. 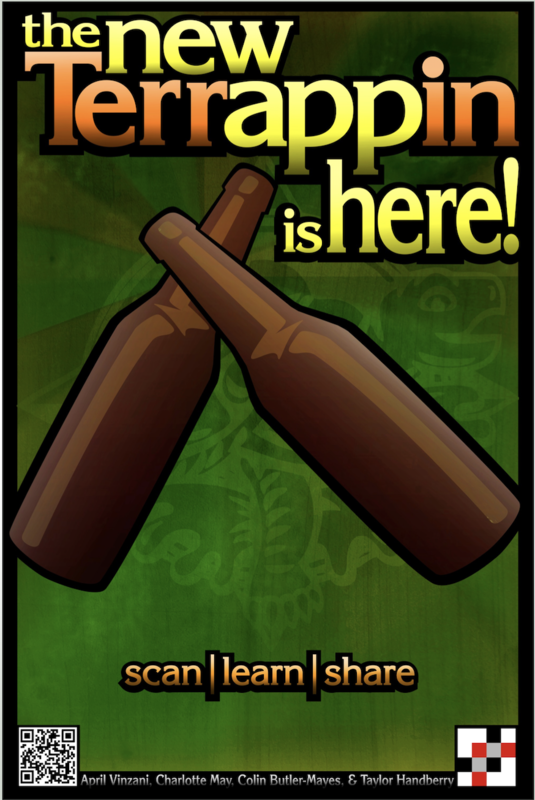 If craft beers are your scene and you are looking for a new and exciting way to share your passion with friends, TerrAppin is the way to go!